Kick back with some Dragon Fire Stout and read this guide. What does a hero have to do around here to get some tasty Krakken Kabobs, or even a few delicious Trog Skewers? 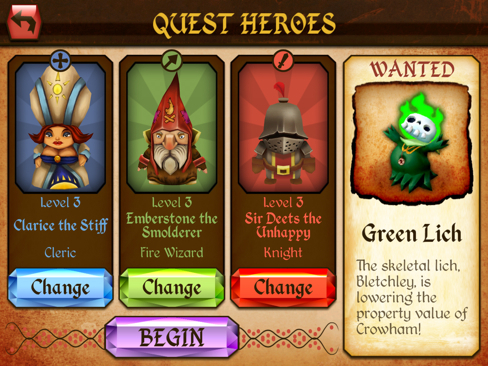 If you're playing Glu Mobile's iOS and Android game, Tavern Quest, then you're all too familiar with that line of thinking. The recently released and free title lets users build their own taverns while recruiting heroes, but getting these warriors to take up residence involves putting food in their bellies, because as we all know, a full knight is a happy knight. 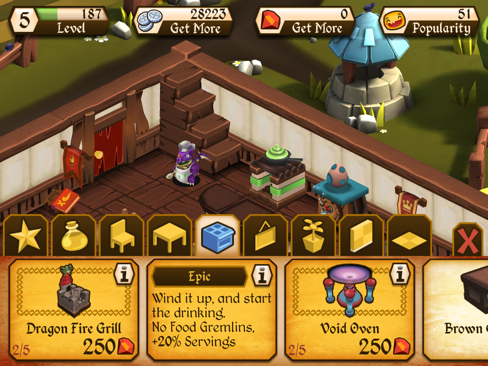 With this in mind, behold our Tavern Quest cheats and tips guide, to help with your cooking and monster bashing needs. 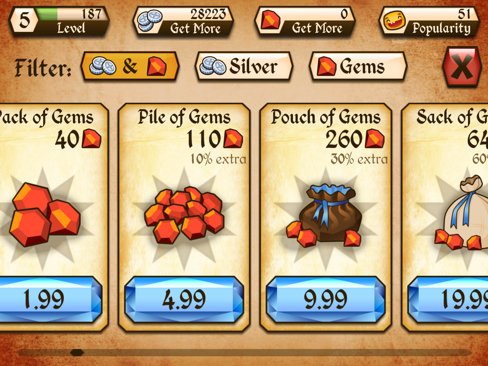 In Tavern Quest, the easiest path to victory involves a virtual bank account full of silver pieces and, most importantly, red gems (gold credits in the Android version). That said, you always have the option of buying these currencies outright. 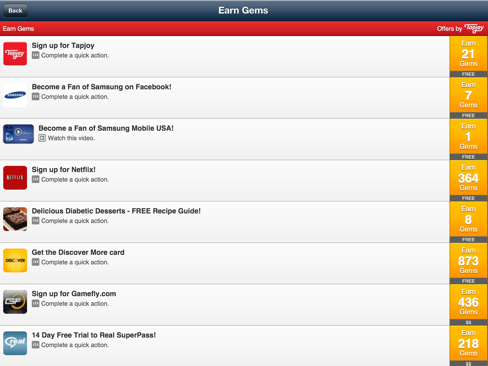 Turns out, Glu provides a plethora of ways to score free gems or credits. Here's a small sampling of ways to earn more gems. Watch video for Tiny Zoo Friends: 1 Gem. Some, on the other hand, cost money. Some dishes, like Grilled Griffon Cheese, take only five minutes to complete. Others, like Stone Troll Steaks, take a whopping six hours. 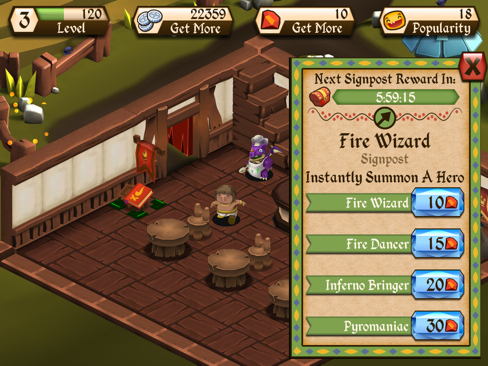 You can put Tavern Quest down and come back to it later, or cook things instantly by parting with some gems. Take those steaks, for example. Six hours, or six gems to do it immediately? 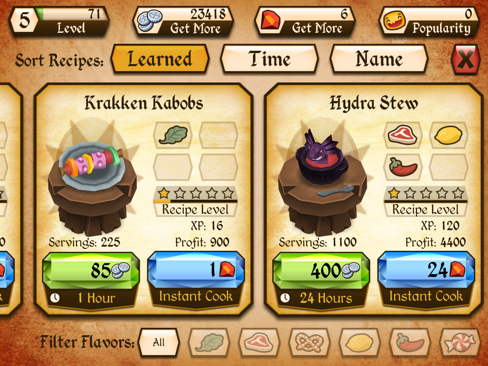 Wait 24 hours for Hydra Stew, or spend 24 gems to whip it up with the quickness? Entirely up to you. 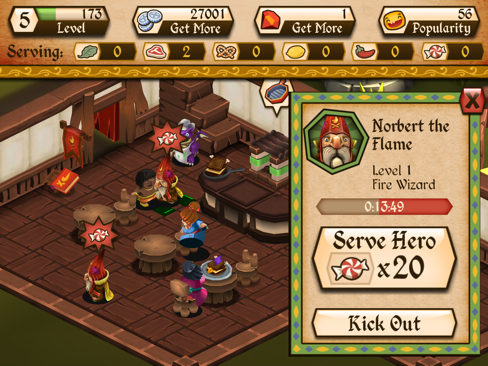 For the most part, Tavern Quest involves decorating your new restaurant/bar and sending heroes on quests to battle monsters. Making money and gaining experience, though, are two keys to success, and you stand to gain a lot of both by finishing goals. You can find the current list of objectives by clicking the book (the one with the star on its cover) on the left side of the screen. On that note, here are a few of the goals you can and will complete. Use the keg to prepare Grog 2 times: 500 Silver, 25XP. Purchase an additional grill or keg: 300 Silver, 20XP. 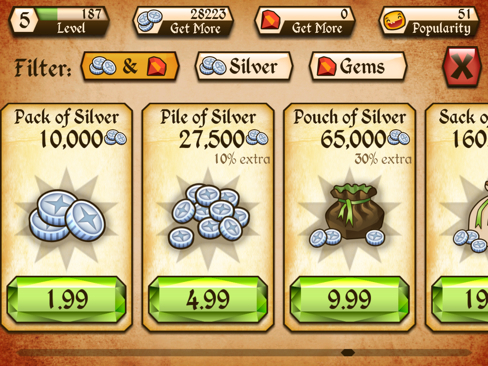 Purchase two tapestry wall decorations from the Store: 750 Silver, 30XP. Purchase a sarcophagus floor decoration from the Store: 8,000 Silver, 250XP. Doing this draws attention from nasty gremlins. Once they get into the grub, you'll need to spend gems/credits to recover the food, or simply discard it. 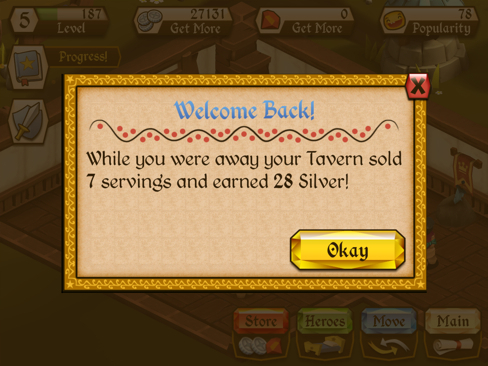 You'll always have a little cash on hand, as the tavern earns silver 24 hours a day, even when you're away from the game. Keep in mind this heavily depends on whether you have food available, and the number of servings per dish. What the heck is a Clockwork Keg, and what possible reason is there for owning a Void Oven? Don't leave yourself in the dark. If you need info on a specific item while in the Store, just click the lowercase "i" on the top right corner of each object to learn more. 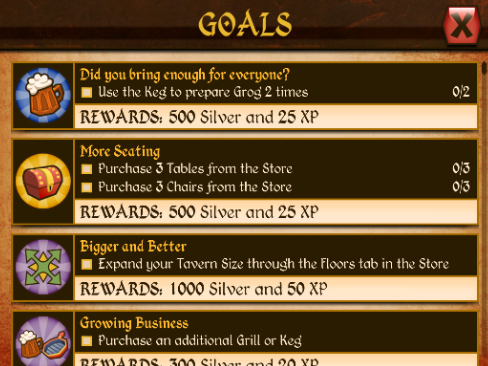 Oh, so a Clockwork Keg benefits from no food gremlins and 20 percent more servings. Sounds useful to us. If you don't have the necessary heroes to complete a quest, you can always buy these warriors, but this costs 100 Gems. 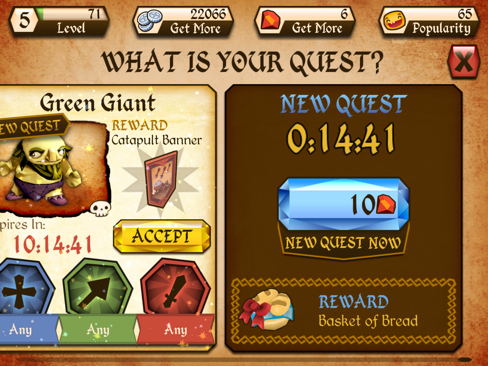 New quests appear after a specific amount of time. If you lack the patience to wait, you can purchase another quest for 10 Gems. 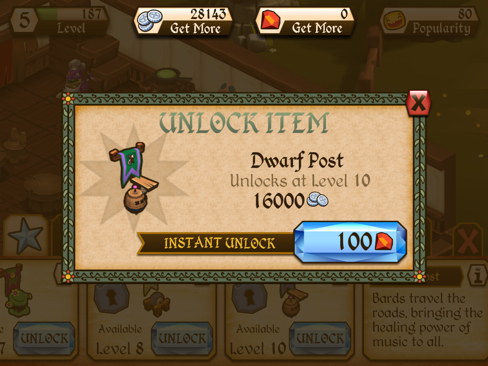 Sure, you could grind it out until the Ornery Dwarf Axmen post becomes available (level 10, by the way), or you can spend 100 Gems to unlock that sucker instantly. You know you want to. Let's say you really want a Black Knight to visit the Tavern. Well, just click on the knight post (providing you have one on display) and spend the required number of gems (in this case, 30), and said Black Knight will automatically appear. 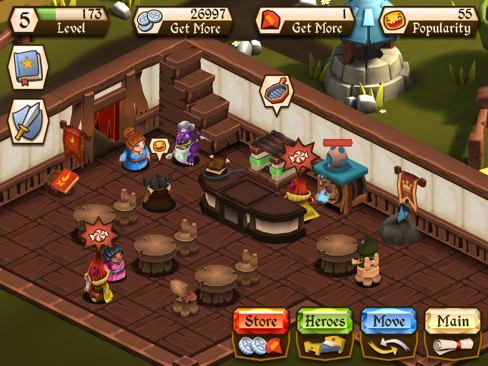 When a new hero walks into the tavern, make note of the symbol above his or her head. From there, head into the recipes list (either food or drink) and make something that corresponds to that symbol. Once it's done, serve this deliciousness to your hero. Just because you invited a hero into the tavern to eat doesn't mean you need to invite him or her to stay. Once a hero finishes the meal, you have the option to recruit or cash out for some silver. 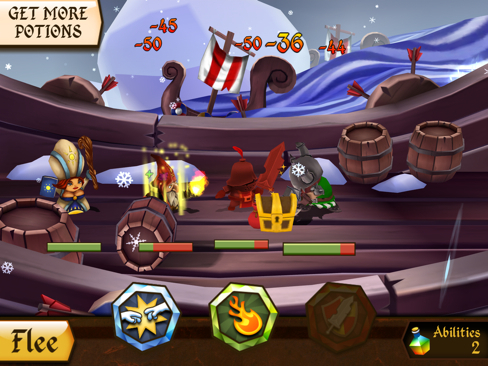 During battle, be aware that heroes move into position based on type. The support class (healers) are in back, ranged stand in the middle and melee (knights) take the front. All heroes have special attacks, but always remember that you can only use each attack once per battle. If he or she croaks, you'll have to revive (this costs money) or lose the hero entirely. During a fight, projectiles will sometimes fly into view. Whenever that happens, tap these things to avoid heroes taking damage. 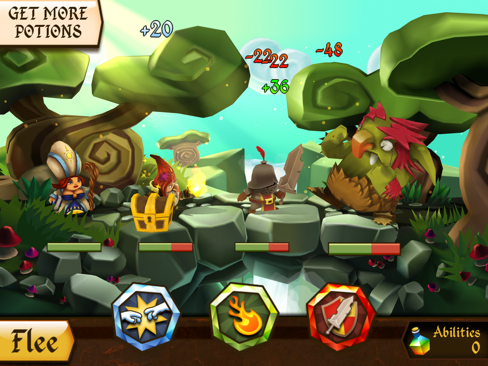 Conversely, enemies often drop loot onto the play area, and you should tap every treasure chest and sack you come across.